The Japanese have been way ahead of the curve in the robot world for many years. 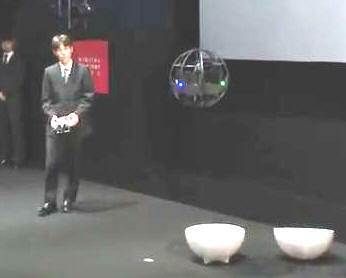 Combining autonomy with wireless control has led to this "Spherical Flying Machine" that was demonstrated by the Japan Ministry of Defense. Beginning with a dose of theatrical showmanship, the mystery craft jumps out of a round Styrofoam container after the lid is suddenly popped off. What emerges is a very obviously highly stable and maneuverable sphere that effortlessly floats above the stage and audience, while intermittently flitting about like a dragonfly moving along the shoreline from cattail to cattail. Multiple onboard gyroscopes provide attitude control and stability so effective that even after being hit or pushed, it rights itself. Flying is not its only method of locomotion; once on the ground the spherical flying machine becomes the spherical rolling machine. It can also hug a wall near the ceiling and navigate through a building. This allows it to be used for surveillance in almost any environment. Its quiet electric motors, most likely powerful, microprocessor-driven brushless models given life by high-C lithium polymer batteries, provide plenty of motivational force. A 2.4 GHz radio control system was used for guidance. Come to think of it, I am surprised that HRP-4C was not chosen to conduct the demo rather than a mere human. Even though the Spherical Flying Machine was developed for military purposes, I'm guessing that soon there will be a consumerized version available via hobby outlets.